This article contains details of torture and gender based violence. Dmitry and Olya’s names have been changed. Dmitry is a colossal man, a brow like masonry, fists the size of bricks and the build of a heavy weight boxer. He looks tough. When he speaks though, his voice is soft. As he tells his story, in one long murmur, he only pauses to smudge away his tears. He lived with his wife and their daughter in a mining town in the Luhansk region in Eastern Ukraine, near the border with Russia. He worked in the mines, they lived a normal life. “We’re just ordinary people,” he said. Tensions began to rip their community apart in November 2013. The Maidan protests in Kiev against the pro-Russian government gripped conversation. Ukrainian TV channels had been blocked. The only source of information was being beamed from Russia, which he said painted the demonstrations as a fascist uprising rather than an anti-corruption movement . You imagine that looking like someone you’d want on your side in a fight is where his problems began. The miners were being recruited to join anti-Maidan groups, but he didn’t want to know. The government eventually fell, having haemorrhaged all authority during a bloody crackdown on the mostly young protesters. The new administration was perceived as anti-Russian, sparking a violent rebellion in the east. The rebels had seized power. They replaced the police with their own. The law broke down, instead the gun ruled. The fighters weren’t unified, with lots of different splinter brigades vying for power and money. Crime became pervasive. While away on a nightshift at the mine, armed men tried to break into his house where his wife and daughter slept. They failed that night, but soon returned. This time they threaten his wife with their guns. A neighbour bought them off by giving them fuel. Now Dmitry owed them and must join, but he still refused. On his daughter’s 4th birthday, armed men arrived at the house. Dmitry received a call at work, saying that he had ten minutes to get there or his family would be killed. Olya looks like a tiny speck next to her husband. Despite a red winter coat, she looks frozen. The scene she described at home that day would chill anyone. When Dmitry arrived, they seized him, put a hood over his head and took him out to a rebel camp in the forest. For four days he was kept in a small hole in the ground. He was only taken out to be tortured, eight men together administering the beatings. They wanted him to declare that he was a Ukrainian spy. They wanted him to kill another man. “They’d tell me a mob is waiting in town to rip me apart if I didn’t,” he said. He resisted. Each day, they’d tell her he would be killed. Each day she came back, walking the 10 km. One night she decided to take a short cut, only to be saved by an old man. She was cutting across a mine field. The fighters give Dmitry an ultimatum to go kill a “known Ukrainian sympathiser”. He had two days. Instead, he warned the man, went home, collected his wife and child and fled. They approached each road block with dread, but finally reached government controlled territory. “The sense of relief was overwhelming,” said Olya. 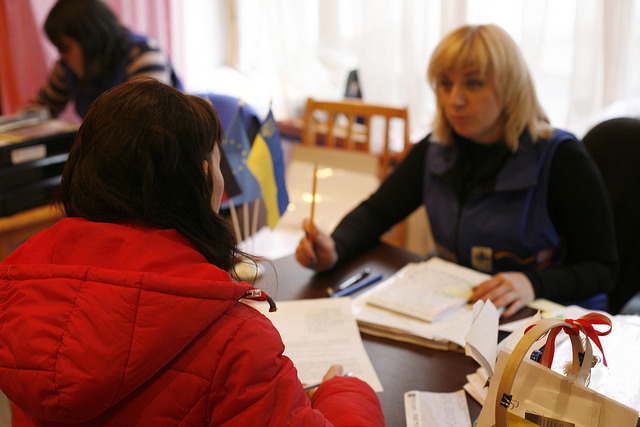 The family became part of the million plus population of people forced from their homes in Ukraine. They set up in Dnipropetrovsk in the east. After two months of medical rehabilitation for Dmitry, they were ready to restart their lives. For Olya, “It felt like a breath of fresh air”. There was no escape for Dmitry however. “I couldn’t cope with the anguish of what these men had done to me,” he said. “I wanted to kill them. I can never forgive them.” He lied to his wife that he’d been conscripted and volunteered to join the army. Caritas provided her with humanitarian aid. They wanted to give her a sense of security. Olya is a practising Christian. Caritas connected her to a parish group who provided her with spiritual support to bring her a sense of calm. “When she had stabilised, we provided counselling. We listened to her story,” said Oleh Chabanenko. “This is a wound in Europe which will repeat itself, unless we build peace. 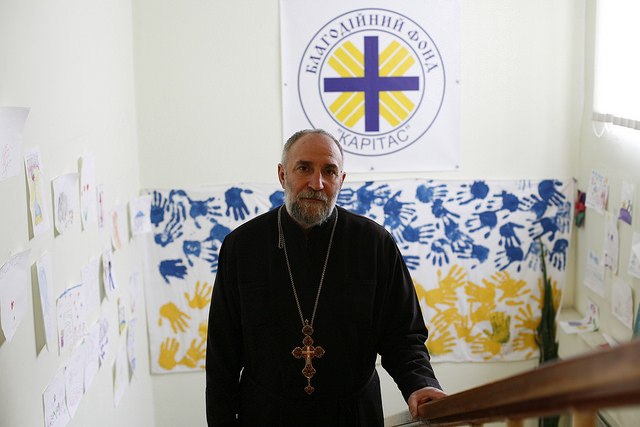 As soon as we start, the better chance that we have got,” said Caritas Ukraine President Andriy Waskowycz. Dmitry and Olya’s names have been changed.